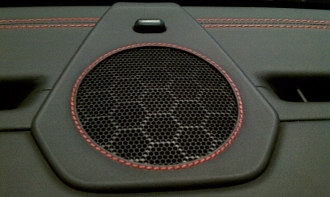 The Exclusive Option Leather Stitched Center Dash Speaker Grill features contrasting stitching surrounding the grill in a circle, complementing the rich leather surface. This beautifully crafted part is an easy DIY snap-in installation and instantly adds an exclusive look to the dash area. This part comes standard on models equipped with the full leather defroster option. Get the look of the factory ordered option with this part and replace that plastic painted grill with an intricately stitched leather piece to give your Porsche an exotic look.